From early elementary school days I recall the well-quoted poem 'Twas the Night Before Christmas. My mother read it to my brother and me every year as she did the Christmas story from the Bible. I remember having a skirt my mom sewed for me that was a complete circle with the poem printed around the bottom. I wore it to school in Fifth Grade class and all the girls were envious of my having such a fun garment. I had "umpteen" crinoline petticoats underneath to make it stand out full and fill the school desk seat when I was seated. Oh, the memories. And that was a long time ago. I always thought I would never be guilty of saying, "Forty years ago..." But, you know, I do it all the time now. Sorry! I'm compelled somehow to do that. On a more serious note, we sadly report the loss of another of our long-time quilting friends, Penny Nichol. What a great quilter and good friend to many. She was one of the appliqué enthusiasts who would come into the shop on Wednesday mornings for all those years to sit and appliqué and exchange life's fun stories and charm us with their chatter. She will be missed. Thankfully we had the opportunity to know all of the lovely ladies who over the years frequented Heirlooms & Comforts regularly. January 5: First meeting of the Thimbleberries Reunion. If you were ever a part of the Thimbleberries Club at H&C you are invited to join us first Thursday of each month for "club". There will be no formal program, and anyone who wishes can bring a game or activity, just as Judy and Joan did all those years, for everyone to participate in. You are invited to bring your lunch or snack foods to share around and to sew, visit, shop, or "play' right through the day. There is no fee for this attendance. We will draw a discount percentage at each meeting for you to get special discounts on whatever you purchase that day. We will draw names for prizes, sing Happy Birthday, laugh at bad jokes, etc. Look for all the fun parts of previous Thimbleberries Club meetings without a pre-planned project. Bring the ones you already have, finished or unfinished, to get critique or aid in getting them completed. Margarett Boyer will be using Joan's email address list to send reminders to those on that list. If you wish to be added to the email list, reply to this letter with that request and we will pass your address on to Margarett. We are looking forward to seeing you Jan. 5 at 10:00 AM. January 11: The Kaffe Club will meet in the shop at 10:00 AM. There is a challenge going on now and it is a voluntary adventure. Remember this is a fee-free event on second Thursday morning each month. You meet with fellow Kaffe Fassett fans to exchange ideas and challenges and to learn from each other new techniques and ideas. The members of this group have remarkable skills they are willing to share with their friends in this diverse group. Come for fellowship, sharing, learning, chillin', fun and maybe even a walk over to one of the lunch venues in Central. Mark your calendar. We want you to come for the fun. Pay in full when you register and get 10% discount on the fee. This starts soon, so we need to be talking about how you want to approach this. Come in very soon to see this quilt and to make your fabric choices. Register for one of the time slots that we offer: Friday mornings or late Monday afternoon. Don't delay; some people have already chosen. January 21: Deadline for saving 20% on supplies listed by the instructor for classes for the winter. Complete registration with tuition payment by Jan. 21 and you will receive this great discount on the supplies. Don't delay. January 18 and 31: These dates are reserved for Sew Days for persons who wish to sit and sew with friends for the day in the shop. No fees are attached. You bring your project, hand or machine done, and sew with friends. Bring your lunch or choose to order in or go out. Sew Day is your day. February 4: Gathering of Quilters is a day set aside for District I members of Quilters of SC who will meet at First Baptist Church in Williamston, SC to enjoy a program that has been developed for the day and to learn from each other on several topics in the world of quilting. More information about this is coming later; for now mark your calendar for the day. At Heirlooms & Comforts this week we will continue to feature our special on Fat Quarters in 6-packs, 12-packs and 18-packs. The special prices apply to fat quarters that are already cut and on display. Great savings and a good way to augment your scrap quilt stash! 6PK for $12; 12PK for $22; and 18PK for $32 - a lot like a late Christmas present. At Heirlooms and Comforts we can offer you 5-D Professional Embroidery Software at ½ price when purchased along with any H-V Designer sewing and embroidery machine. With this combination you can be well suited for creative machine work that puts others "in the shade." As advertised on the Husqvarna Viking web site there is a finance plan for the purchase of a Husqvarna Viking Designer sewing and embroidery machine. You can get 36 months of financing with 0% interest right now. That is a really big opportunity to get sewing and embroidering. Any Designer jewel qualifies: Topaz 20 or 30, Ruby, Diamond, or Diamond Deluxe. See us soon for this screaming deal - software, Designer machine and no-interest financing. Happy New Year! There is more to life than sewing, quilting, and grandchildren. There is food, right? Lately I have been reading about a young chef in the Athens, GA, area who has a connection to our area as well. And when a new "star" appears in the "sky" isn't it fun to say, "I remember when..., before she/he achieved fame"? Well, lately several names have prompted that response from me when I have seen their names in print. Hugh Acheson is a rising star name that we have seen in print a lot lately. One day last week there was an article in the newspaper about his new book about Southern foods and his restaurants in Georgia. Hugh is the son of Mary Acheson Lindsay who worked with us at Heirlooms & Comforts when we were downtown Clemson in the late 1980's early 1990's. Hugh and his sister were in school for a while with our children. Now he is the subject of numerous articles in newspapers and even in Southern Living Magazine as a part of the Comfort Foods article. His wife is our daughter's classmate from High School. Look on line for articles about Hugh, a Chef with a rising star that once sailed over Clemson. Also, I recently read about Marjan Kluepfel in an ad about the Mid-Atlantic Quilters Show in Hampton, VA. Marjan has been teaching there for a number of years, coming east from California to instruct. She works with botanicals and replicates or interprets them in fabrics. Go to www.marjankluepfel.com and read about her. When she was in Clemson years ago she would frequent H&C for fabrics and supplies. It is nice to be able to say I remember her when she was working alongside Priscilla Hair (another of our friends with renown) exploring techniques. It is fun to say, "I knew her/him when..." We all love to be associated with persons of renown - our own claim to fame. Keep sewing and quilting and one day maybe we can say that about you. At Heirlooms and Comforts this week we will feature fat quarters in bundles of 6, 12 or 18. A 6-pack is $12; a 12-pack is $22; and an 18-pack is $32. These bundles are 6, 12, or 18 of your choice from the fat quarters that are already cut and folded and arranged in our fat quarter bin. "Fresh-cut" fat quarters do not qualify for this special price. We will also continue to run the 50% off price on Christmas fabrics with a minimum cut of 1yd. Load up for next year if you have completed your holiday sewing for 2011. Otherwise, finish off your 2011 holiday sewing with finest quality fabrics at a bargain price. At www.husqvarnaviking.com you can find that H-V is joyfully giving you a number of good things and lots of good ideas. For one, there is the $25 off a $50 order from www.myembroideries.com until the end of day on December 23. There is also "The Joy of Giving" window where you can click in and get ideas and patterns and suggestions for other fun things to make and to have. Check out the site and have some holiday fun. At Heirlooms & Comforts we can offer you 5-D Professional Embroidery Software at ½ price when purchased along with any H-V Designer sewing and embroidery machine. With this combination you can be well suited for creative machine work that puts others "in the shade." As advertised on the Husqvarna Viking web site there is a finance plan for the purchase of a Husqvarna Viking Designer sewing and embroidery machine. You can get 36 months of financing with 0% interest right now. That is a really big opportunity to get sewing and embroidering. Any Designer jewel qualifies: Topaz 20 or 30, Ruby, Diamond, or Diamond Deluxe. See us soon for this screaming deal - software, Designer machine and no-interest financing. Ho, ho, ho! I hear that some people are already prepared and ready for the Christmas Holiday! How can they do that so well? How can it be done without last minute rush and jitters? Well, we at Heirlooms & Comforts would like to help you out with your preparations if we can. We are happy to share our suggestions for how to get by without having jitters and tears for lack of preparation. Just ask us when you are in the shop for tips on gifts, stocking stuffers, and miscellaneous items including foods. We always have an opinion; have you noticed? And, we obviously love foods as you can tell by looking at us. At Heirlooms & Comforts this week we will feature 50% off Christmas motif fabrics (1 yd minimum cut, please). Yeah!! Last minute gifts of tea towels with a holiday print sewn on the hem are fun to make and inexpensive hostess gifts during this season. Also, you can appliqué a cute shape to sweatshirt or an apron or a hand towel. There are many other suggestions we can add when you are in the shop. Just heed this last call for Christmas motif fabrics at 50% off. The $500 Rebate from Husqvarna Viking when you purchase a Designer Diamond Deluxe is NOW. The offer ends on December 15, 2011. Buy your deLuxe by close of business on Thursday and qualify for a manufacturer rebate of $500. This doesn't happen often and the qualifying machine is super special as well. You get the capability of using the 15-inch square hoop in machine embroidery. There is easy maneuverability of designs on the machine screen as well. This machine is the BEST and the savings are tremendous. Don't let your personal Santa miss this. Monday Is Final Day to Save $50 off $75! Until midnight Monday, December 12, you can save $50 off the purchase of $75 of embroidery designs at www.myembroideries.com. Just go on line to that site and choose at least $75 worth of designs. Use the code provided for you when you check out, making sure you have chosen Heirlooms & Comforts as your dealer. Then you save big. Download your designs in the proper format for whatever machine or software you are using. Enjoy stitching! Are you making a list and checking it twice to see if you have forgotten to make something wonderful for everyone? Well, we can probably help you or those who shop for you with planning for having it all done properly. Have you seen the great table-full of gifting ideas that Sue put together in the shop? She has some good ideas for the Secret Sister or the co-worker or the daughter who sews or the grandmother who crafts. On the top is the Gift Certificate from Heirlooms & Comforts that allows the recipient to choose exactly what she wishes to have this year. Drop by the shop to see the arrangement on the "idea table" and to purchase the Gift Certificates that fit just right into the stockings hung by the chimney. 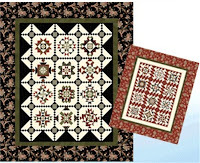 At Heirlooms & Comforts this week we will feature patterns at 20% off. This is a terrific idea for stocking stuffers. 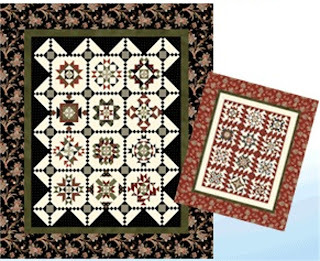 Patterns are for quilts, table runners, jackets, purses and totes, Redwork, wall hangings, appliqué, and more. The choices are many and the value is great this week - 20% off your choice of pattern. The Husqvarna Viking offer of $500 Consumer Rebate on the purchase of a Designer Diamond deLuxe sewing and embroidery machine will expire on December 15, 2011. This is a big offer for those who wish to have the Diamond deLuxe. Don't let your special Santa miss this opportunity for making you the happy recipient of this great machine. Remind him to be sure to come by this week to make this deal! Go to the Husqvarna Viking Web site to get a free embroidery design and project instructions each month. During December you can get a Christmas tree design to incorporate into a Greeting Card Holder free project. Be sure to follow the instructions on the site for getting the designs at no charge. Then you can print out the .pdf file for the project. Enjoy making this handy hanging. At Heirlooms & Comforts during the month of December the purchase of a Sapphire 875 will carry with it a free Limited Edition Quilter's Kit that includes a Quilters Foot Kit, an Extension Table, a Travel Bag for the Extension Table, a Spinner Tray for the Extension Table, and a Quilting Needle 5-pack. A $320 value is Free, Free with the Husqvarna Viking Sapphire 875 purchase.